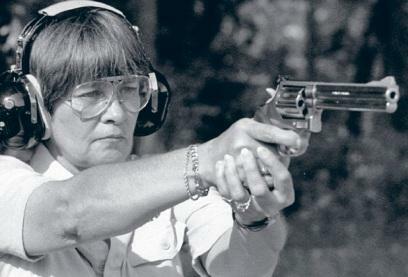 Marion Hammer was the NRA's first female president. Marion Hammer, the National Rifle Association’s influential Tallahassee lobbyist, filed federal and state lawsuits Friday seeking more than $2 million in damages from five men she says have targeted her over her Second Amendment advocacy following the massacre at Marjory Stoneman Douglas High School in Parkland. Describing Hammer as “a 79-year-old grandmother and nationally renowned civil rights advocate,” the federal lawsuit filed in U.S. district court in Tallahassee contends four men have made her the focal point of “hate and vitriol” through phone calls, emails and other communications. “There is a marked difference between speech and harassment, and there are clearly delineated bounds of human decency that no person can cross by using fear, intimidation, and threats of violence to lash out at and try to silence those with whom they disagree,” the 31-page federal lawsuit said. “The defendants have transcended mere criticism and employed threats, harassment, and personal abuse to try to humiliate and intimidate Hammer in a manner that is utterly intolerable in a civilized community,” the lawsuit added. The second lawsuit was filed later in the day in Leon County circuit court against Brian Fitzgerald, who is identified as a 66-year-old resident of Miami-Dade County. Each lawsuit seeks “in excess” of $1 million in damages. The NRA has come under heavy criticism from gun-control advocates since the Feb. 14 shooting at Marjory Stoneman Douglas High School that left 17 students and faculty members dead. The Second Amendment group also filed a federal lawsuit against the state in March, hours after Gov. Rick Scott signed into law a school-safety measure that included new age-related gun restrictions. Both lawsuits filed Friday included graphic examples of emails Hammer received, with many including obscenities and other words that are not typically published by news organizations. The federal lawsuit lists Risica as a 38-year-old man from New London, Conn., and Sorensen as a 67-year-old man from Camarillo, Calif.
Sorensen acknowledge in a phone call Friday that he sent Hammer two emails on March 24 that included photos of gunshot wounds, including one said to be of President John Kennedy. Sorensen said he sent the emails after viewing a documentary on assault-style rifles. But he otherwise denied he made threats to Hammer or made comments to encourage others to do so. Sorensen, calling himself “an apolitical person,” also denied knowledge of the other defendants. Sorensen’s emails are noted in the federal lawsuit, but it doesn’t include him when alleging that Risica, Weiss, and Sullivan sent e-mails containing indirect or direct threats accompanied by personal attacks. Marion Hammer is one of Florida's most-influential lobbyists. She served as president of the National Rifle Association from 1995 to 1998, is a member of the NRA board and has been the executive director of the Unified Sportsmen of Florida, the state's NRA affiliate, since 1976.